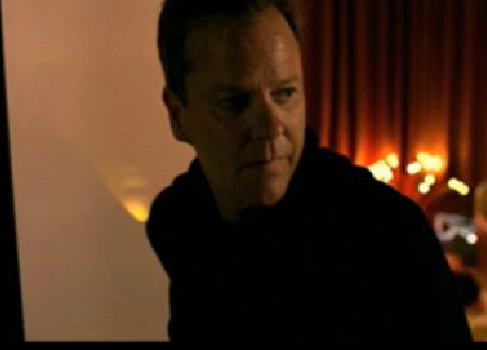 One of my favorite guys, Kiefer Sutherland is returning to TV and I couldn’t be happier. I am still not over losing ‘24‘…. what can I say… I love the guy and I loved the show. He’s starring in the new FOX drama series, Touch and it looks pretty dang good! At the center of “Touch” is Martin Bohm (Sutherland), a widower and single father, haunted by an inability to connect to his mute 11-year-old son, Jake (David Mazouz). After multiple failed attempts at keeping Jake in school, Martin is visited by Clea Hopkins (Gugu Mbatha-Raw), a social worker sent to evaluate Jake’s well-being. Everything changes when Martin discovers that Jake possesses the gift of staggering genius – the ability to see things that no one else can and the patterns that connect seemingly unrelated events. Jake is indeed communicating. But it’s not with words, it’s with numbers. Martin meets Arthur DeWitt (Danny Glover), a professor and an expert on children who possess special gifts when it comes to numbers. Now, it’s up to Martin to decipher the meaning and connect the numbers to the cast of characters whose lives they affect. Touch will debut in the spring, so get ready to set those DVRs!